With the holidays literally right around the corner, you don’t need to worry about blowing your journey to a healthy lifestyle away! 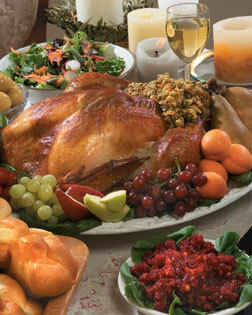 I’d like to give you a few of my healthy Turkey Day tips so you can eat whatever you want and still not go overboard. Also, an added bonus: healthy, low cal butternut squash gratin recipe! Try not to eat the skin of the turkey, this can add over 10 grams of fat! Do not starve yourself all day, thinking you are banking your calories for the big dinner; you will most probably be so hungry by dinner time, that you will overeat. Instead, snack on fruit and veggies throughout the day. Eat a bowl or two or broth based soup before the big meal. This will fill you up without adding a lot of calories. After eating such a heavy meal, try not to dent up your couch. Instead, get some fresh air and go for a family walk a few times around the block. Preheat oven to 375°F. 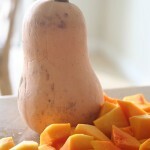 Place butternut squash cubes and olive oil in large bowl; sprinkle with salt pepper and toss to coat. Place squash on a baking sheet, and bake for 20 minutes. Melt the yogurt butter in heavy medium skillet over low heat. Add sliced leeks, salt and rosemary. Sauté until leeks are tender, about 15 minutes. In a baking dish, spread half of leek mixture over bottom of prepared baking dish. Add half of the roasted squash, and then top with half of the goat cheese. Repeat layering with leeks, squash, and cheese. Pour milk evenly over gratin. Top with toasted walnuts. Bake the gratin for 35-40 minutes, or until the milk is bubbling. Allow to cool, and enjoy a wonderful serving! This entry was posted on Tuesday, November 24th, 2009 at 12:19 pm and is filed under Food.